Witherspoon Straight Bourbon Total Wine & More Single Barrel Pick (50.0%): I am awfully late for this one... A close friend of mine and a colleague who is also a very proud Texan brought me this bottle months and months ago from his home state and I somehow couldn't find a chance to pop it open before today. I am very sorry Patrick... Let's make it up... It is a single barrel (#F043) Witherspoon straight bourbon whiskey picked by Total Wine & More. 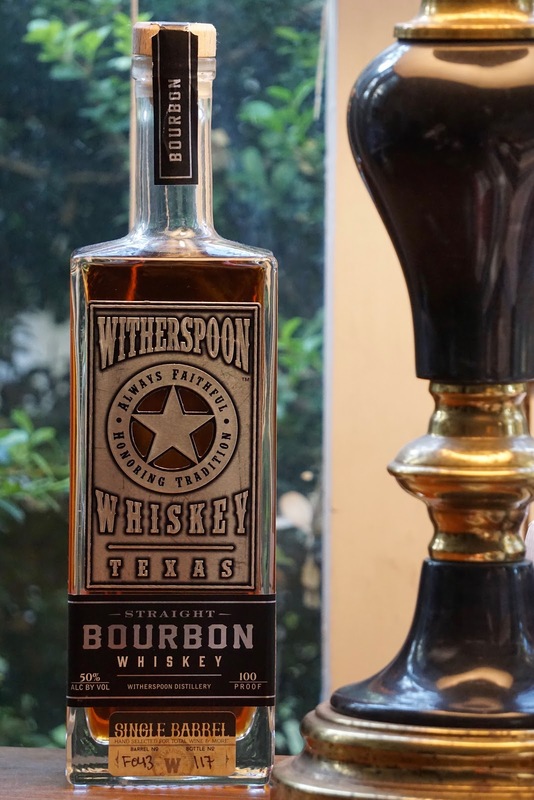 Witherspoon Distillery is founded by former US Marines in 2011 in Lewisville, Texas just north of Dallas. They distill single malt whiskeys besides bourbon as well and also bottle cocktails and a bourbon cream liquor. Their bourbon has a mash bill of 75% corn and the rest is rye and malted barley. Finish: Long and incredibly dry. Rust, red pepper and bitter oak.